IHC for phospho-Neu Y1248 in tumors, 1 hour after lapatinib treatment (day 1, d1), and day 7 (d7), 1 hour after final treatment with BMS-777607. Representative images are shown. Flow cytometry analysis showing band 3/α4 integrin expression of luciferase and TET2-knockdown CFU-E cells cultured for 13 days in the presence of DMSO or 0.2 μM R428. Cabozantinib malate (XL184) is the malate of Cabozantinib, a potent VEGFR2 inhibitor with IC50 of 0.035 nM and also inhibits c-Met, Ret, Kit, Flt-1/3/4, Tie2, and AXL with IC50 of 1.3 nM, 4 nM, 4.6 nM, 12 nM/11.3 nM/6 nM, 14.3 nM and 7 nM in cell-free assays, respectively. Effects of AXL inhibitors on induction of pAKT and rescue of pERK following AXL overexpression. R428, 500 nmol/L; XL184, 3 umol/L; XL880, 100 nmol/L; in the presence or absence of 2 umol/L PLX4720. shAXL is a positive control. UNC2250 is a potent and selective Mer inhibitor with IC50 of 1.7 nM, about 160- and 60-fold selectivity over the closely related kinases Axl/Tyro3. a-c Concentration of secreted IL-1β, IL-8 and CCL2 in THP-1 macrophages treated with or without recombinant human IL-37 (rhIL-37) for 3 h, followed by incubation for 1 h with or without Mertk inhibitor and then incubated with lipopolysaccharide (LPS) or MSU separately for a further 18 h; *P < 0.05. d Different dosage of rhIL-37 was given preventively or therapeutically with or without Mertk inhibitor intervention in mice with gouty arthritis, and foot thickness was evaluated; *P < 0.05. e, f Histopathological analysis by H&E staining in a joint from the group treated with rhIL-37 treatment and Mertk inhibitor intervention (×100 original magnification (e) and × 200 original magnification (f); arrow inflammation in soft tissue and joint space. TP-0903 is a potent and selective AXL Inhibitor with IC50 of 27 nM. Phosphorylation of Axl was analyzed by Western blotting of whole cell lysates using different antibodies. GAPDH was used as an internal control. H1299 cells were stimulated for 15 min with 400 nM recombinant human Gas6 (rGas6). H1299 cells were treated with or without TP-0903 (0.2 µmol/L) for 24 h.
UNC2025 is a potent and orally bioavailable dual MER/FLT3 inhibitor with IC50 of 0.74 nM and 0.8 nM, respectively, about 20-fold selectivity over Axl and Tyro3. LDC1267 is a highly selective TAM kinase inhibitor with IC50 of <5 nM, 8 nM, and 29 nM for Mer, Tyro3, and Axl, respectively. Displays lower activity against Met, Aurora B, Lck, Src, and CDK8. Time- and dose-dependent effects of LDC1267 in RSC96 cells. UNC2881 is a specific Mer tyrosine kinase inhibitor with IC50 of 4.3 nM, about 83- and 58-fold selectivity over Axl and Tyro3, respectively. RXDX-106 (CEP-40783) is an orally-available, potent and selective TAM(TYRO3, AXL, MER)/MET inhibitor displaying low nanomolar biochemical activity and slow (T1/2 >120 min) inhibitor off-rate in peptide phosphorylation assays and in vitro kinase binding assays, respectively. 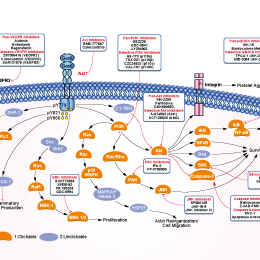 Sitravatinib (MGCD516) is a novel small molecule inhibitor targeting multiple RTKs involved in driving sarcoma cell growth, including c-Kit, PDGFRβ, PDGFRα, c-Met, and Axl. Gilteritinib(ASP2215) is a small-molecule FLT3/AXL inhibitor with IC50 values of 0.29 nM and 0.73 nM for FLT3 and AXL, respectively. It inhibits FLT3 at an IC50 value that was approximately 800-fold more potent than the concentration required to inhibit c-KIT (230 nM).